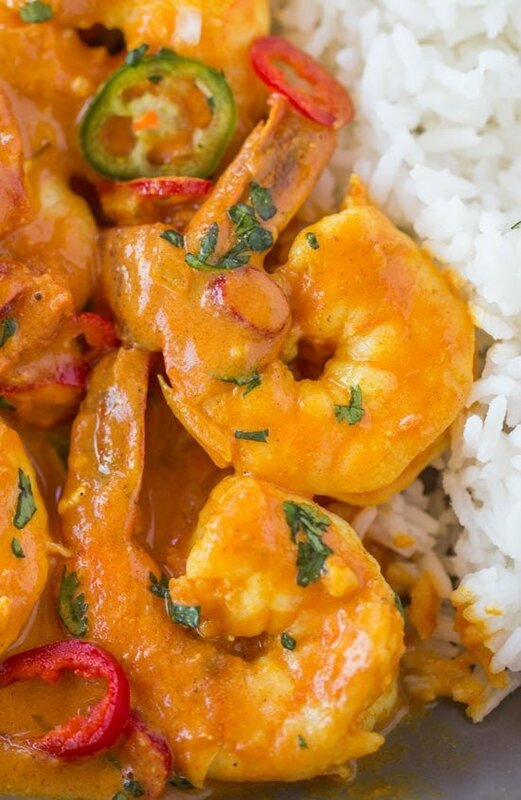 Indian Shrimp Curry made with coconut milk, tomato sauce and warm Indian spices is a quick 20 minute curry dish you can enjoy any day of the week! Hello again everyone, it’s Sabrina again from Cooking with Points – a recipe blog dedicated to Weight Watchers friendly recipes. Indian curries at my favorite restaurants have always been difficult to enjoy on Weight Watchers because of the heavy use of cream in recipes. I wish I could say that recreating those recipes at home was a breeze, but most people are pretty intimidated by cooking Indian food. 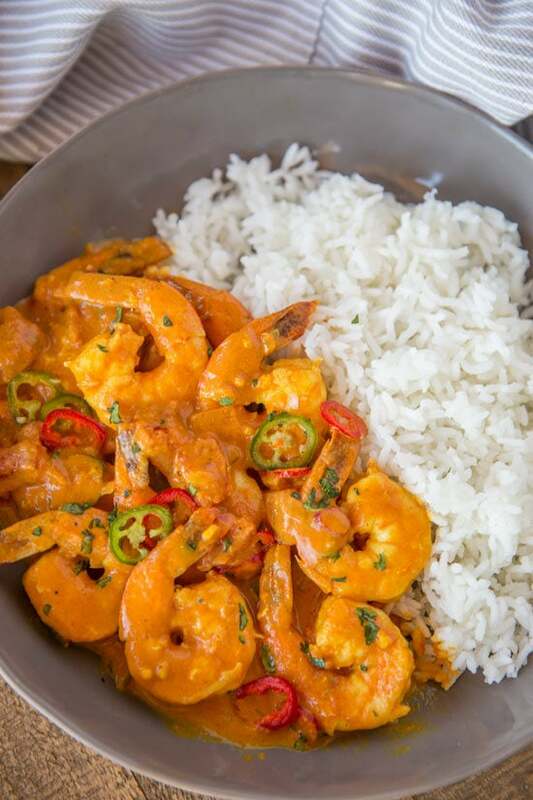 This Indian Shrimp Curry throws all the preconceptions of how long and difficult curries are out the window. The spices are very easy to find at your local grocery store (I checked and my local grocer had ever single one of the spices below in their store brand as well). The actual recipe is even easier than sourcing the ingredients. Made in one small pan the spices bloom in just seconds and the whole recipe is cooked, start to finish, in just 15 minutes. Swap heavy cream in recipes for coconut milk. I use lite coconut milk and cut the amount of cream they call for in half. Instead of sautéing foods in oil only to then be cooked (or braised) in sauces, poach them in the sauces instead. Indian food has such bold flavors, you won’t even miss the flavor from the searing. Use lean proteins and cook them quickly to avoid overcooking them. 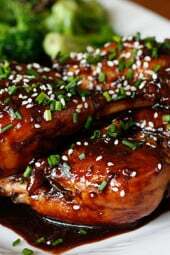 Salmon, shrimp, chicken, turkey and tofu are all fantastic options for swapping into lamb or dark meat chicken recipes. I call for only 3/4 cup of the lite coconut milk in the recipe. Instead make a double batch of the sauce on Sunday when you are meal prepping by using the whole can of milk. Freeze the second half of the sauce in an ice cube tray or ziplock bags (this sauce freezes perfectly). Then, when you want a quick meal, or even if you pop into your local grocery store for a rotisserie chicken one night you can put this sauce in a saucepan on low-medium heat to gently heat and serve. Looking for more shrimp dishes? Try my Mexican Shrimp Burrito Bowl or my Spicy Garlic Salmon recipes, they’re also done in less than 20 minutes! Add 2 teaspoons of the canola oil on high heat in a large skillet. Add the shrimp and cook for 1 minute on each side then remove the shrimp from the pan. Add the remaining teaspoon of the canola oil to the skillet with the onions. Cook the onions for 5 minutes on medium heat, stirring occasionally. Add in the ginger, cumin, coriander, turmeric, paprika, curry powder, chili powder, salt and garlic. Stir well, letting cook for 30 seconds then add in the tomato sauce and combine. Add in the coconut milk and shrimp to the pan and stir well. Garnish with cilantro and chili peppers if desired. Anyone know what the points are using heavy cream instead of lite coconut milk?. Wish people would just a review when they’ve actually made and tasted the reccccipd,I know I am now contradicting myself, but so annoying reading through loads of bum gf before you find real reviews of the FOOD! I don’t know if it was the spice combo, or the lite coconut milk instead of full fat, or something else, but for me this was just okay. There are leftovers so I’ll see if the flavours are blended a little more tomorrow. Based on tonight’s attempt though, I know I won’t make it again. This was a miss for me – rare with this site. It was pretty tasteless. You couldn’t taste the spices or coconut milk amidst so much tomato sauce. I added the rest of the can of coconut milk, a bit of cream, and a bunch of salt, which helped. Maybe it’s my light coconut milk? Anyone find a good brand? My partner and I loved this! Will definitely be making again. I did not have any chili peppers so i added a bit of cayenne pepper to make it spicier. This was delicious and flavorful and I will be makin it often. Thank you so much.. I just made this dish on Friday night and it was DELICIOUS! My husband and children loved it and would like me to make it again soon! This recipe is a keeper! Way I can describe the flavor is flat. I was surprised there was so little flavor, and it definitely needed salt. We all are it without complaint. It just wasn’t representative of the SkinnyTaste recipes we all usually love. I’m a very novice shrimp cooker. 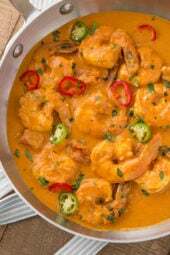 Could I use frozen already cooked shrimp in this recipe? Would I have to adjust time or anything? Thanks, Gina! Delicious. I added 1/4 cup of half and half, 1 tsp of sugar to balance the acidity. Used 3/4 can of coconut milk and 1/2 can of tomato sauce. I also added some cilantro. This is a good base recipe! The key is to cook the sauce in the am, and then add shrimp, and reheat in the evening. allows flavors to blend! So i realized I only have coconut oil or butter but coconut milk! Would plain Greek yogurt work you think with maybe some coconut oil to get that flavor in there? Making this tomorrow! I made this sauce tonight and attempted to double the recipe as recommended. I doubled all the ingredients and this did not come out as a curry sauce at all. Could you please clarify what is required to double this? Do you only use the entire can of coconut milk and leave all other ingredients the same? I love curry sauce and was really looking forward to it ???? Another winner. I don’t know what I would do without your recipes. They are terrific. Really enjoying Indian flavors. The recipes are instructive and teach about new ingredients and how to add flavor without all the fat, carbs and calories. Wish restaurants would cook like this. Amazing! My four and eight year olds loved it too! I don’t think I would be as successful as I am on WW without these recipes! My family loved this dish! It was so easy to make and they ate it all. I followed the receipt exact, but I’m tempted to try adding peppers for more veggies. It saved wonderfully for lunch the next day, too! Making it again tonight! Glad you enjoyed it Jessica! Absolutely Delicious. We doubled the recipe and going to have it multiple nights. This is the second curry we made from you that was fabulous! thank-you. Loved this. It was a bit saucy, but that just meant the was lots for the rice!! We had this with a side of sliced cucumbers which was a nice mix. The curry isn’t super spicy and it doesn’t hit you over the head with the spices. It’s a nice, gentle, comforting flavor. I missed the cilantro in and it brightened the flavors. This was really great! I made it with a few modifications, mostly because I’m not good at following directions — I used fresh ginger, added some mustard seed with the spices (omitted coriander because we’re out of it), added cauliflower florets, chick peas, baby corn and tofu instead of shrimp. Use crushed tomatoes, and added some water because it was a little thick. Like I said, I didn’t really follow the directions. BUT, the basic sauce was pretty much the same ingredients, and tasted great. My 8 y.o. son really liked it, too! Just want to clarify the can of tomato sauce. Do you simply mean a can of crushed tomatoes? Or a sauce with seasoning etc. This one didn’t turn out well for me. Didn’t have much taste at first but then had a really strong (a little too strong) after taste. But I can never really get curry recipes right. Love your website Gina! I have been a fan for years. Thank you for making “dieting” bareable! I definitely agree with you. This was my first time working with some of these spices despite having had them in plenty of Indian restaurants. The one thing I could not get passed was that the flavor was very strong and extremly salty tasting, even though I didn’t use any salt whatsoever. I was dying for water after eating it. It felt like it needed more coconut milk or some sweeter element to balance out the harsh salt taste. If anyone can help me, I would absolutely love to try this recipe again! I agree. Very tomato-forward and not super flavorful. If doubling recipe I would double everything but the tomato sauce. I made this tonight and it was definitely a hit with the hubby! I made this last night, and it was very easy and tasty! My sauce was a bit darker than this picture, but that may be because I only had chipotle chili powder on hand. Next time, I think I would add a slightly sweet element, such as some mango. This was just amazing!! My kids have never eaten Indian food before and they basically licked their plates clean! Thank you so much for all of these amazing recipes! Finally- I can make something for my husband, myself and my children that we all love and I don’t have to break out the chicken nuggets! I added green peas, and didn’t have tomato sauce on hand so I just used a little ketchup til it looked right. Definitely ended up being a couple teaspoons rather than 15oz. I used aldi frozen uncooked shrimp that i defrosted and put it in after the onions and garlic with the seasonings and then added the coocnut milk and ketchup, lastly the peas. Help! When I put this into my App Tracker it comes up with 6 points. Is it accurately 2 freestyle points? Darned Tracker LOL! Not my favorite. Probably would not make again. I just made this tonight. Taking a break while stuffing my face. This is SO good!!!!! I swapped salmon for the shrimp. Fantastic!!!! Made this tonight and agree with others who commented that there was too much tomato sauce. The spices seemed like the right blend … just too much tomato which overpowered the coconut flavor. Love all your recipes Gina, so I’m sure this one will be another hit with one small tweak! First try was too much tomato. Tried again and doubled recipe using one can of tomato sauce and one can of lite coconut milk and it was much more balanced. Both times it tasted much better as leftovers. Looks delicious! Only thing about Indian curries is that I find I miss vegetables in them. To this, I’d probably add bell peppers. Do you have any other suggestions? A side dish perhaps? I made this last week per recipe. I found it had too much tomato sauce. Maybe using chopped fresh or canned would be better and a lesser amt. also felt there was too little coconut milk. That said, the spice mix was great. Could easily adapt to chicken. We loved it. Used full fat coconut milk…only because I didn’t have light. Used red pepper flakes because I didn’t want to go to the store. I only used 1/3 of the can of tomato sauce because I’m not a fan of it. While this was a tasty and quick dish to throw together for a weeknight meal, I agree with others that there was a lot of sauce for just a pound of shrimp. I will make this again, but either double the shrimp or cut back on the amount of tomato sauce or coconut milk ( or a portion of both). I think the amount of liquid is what dulled the effect of all the spices for some cooks. It’s a pretty dish that works well for company too. I love the idea of adding some squash/pumpkin as mentioned above by another poster. Thanks Sabrina. Made this last night!!!! So easy and it was delicious!!! Thanks for the recipe! Made this, this week. It was delicious. We served it over roasted spaghetti squash to keep it really low carb. Leftovers a couple days later really picked up more heat. Made this last night. It was delicious. 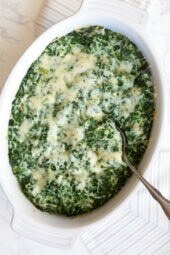 I added frozen spinach to the sauce which helped make the dish more substantial and gave it some vegi power. Eating the leftovers now for lunch with quinoa. Will definitely make again. I made this and was largely underwhelmed. It needed quite a bit more salt, and I’m sure I nearly doubled the quantities of spices as I added more in in an effort to make it taste better. It didn’t taste “bad”, and I’m sure it’s a good base, but it definitely needs some doctoring to make palatable. 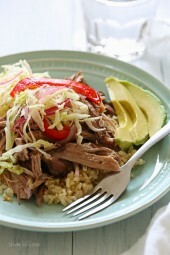 This just went to the top of my favorite Skinnytaste recipes (sorry white bean and chicken enchiladas)! Followed the recipe exactly and would not change a thing. Loved the addition of the optional chili peppers (if you’re a spicy fan, don’t leave them out). I’m obsessed with Indian cooking right now & this was fabulous. I used it over cauliflower rice & my husband put it over regular rice, both were so good. Thank you so much! Yum! This has marvelous flavor….pretty deep for such a quick dinner. I made all the sauce for 3/4 of the shrimp so that we would have plenty of sauce left for rice. I loved the flavor, but my husband thought it needed some heat….so a little siracha or sambal olek added table side would be great. It’s super-quick to make, so it was perfect when we got home rather late. Don’t skimp on the spices…this comes out absolutely mild. I made this and thought it was a little bland, I added chili garlic sauce taste and now I’m sold. I will say too, after it sat of a few days in the fridge I felt like it was even tastier! I would make this again! This was not good at all, both me and my husband did not like it and we like Indian food. So easy. I used pre-cooked frozen jumbo shrimp from Aldi which I defrosted then added at the end so they would not overcook. I doubled the curry powder, increased the salt to taste and added a red bell pepper (seemed it would welcome more veggies.) Delicious and a big hit with my husband.Next time I might reduce the amount of tomato sauce. I served it over cauli-rice. Another winner! Had this for dinner last night. I am a disciple of Skinnytaste but I must say this recipe was a little off. The recipe called for double the amount of tomato sauce you would require to get the final results to look like the finished photo. The recipe mentioned coconut sauce of course I assumed she meant cocunut milk. Didn’t see when the salt was supposed to be added. Lastly,, surprisingly I found the flavor a little flat. I added a teaspoon of garam masala and that did the trick! This was a big disappointment for me, which is so rare with Skinnytaste. I followed the recipe with no changes. It didn’t look like the pick at all. There is far to much tomato sauce and the end result looked and tasted more like a tomato pasta sauce than a curry. Small correction here: I added the coconut milk after I sauteed the dry ingredients with the pumpkin. Let it simmer for about 15-20 minutes to ensure pumpkin was cooked through (fork test, if not sure) then I added the shrimp. Tossed in frozen peas at the end too to cook with the shrimp (10 mins). Fantastic recipe here. Slight cheat: added a Jamaican curry powder instead of some of the individual ingredients on the list. Also, cubed (1 inch) up some pumpkin (yam would work too) and slow cooked it in the curry broth. I didn’t add the shrimp till after the pumpkin was cooked all the way through. The shrimped cooked in the hot bubbling curry (10 mins). This was amazing. Another new family favorite!!! Yummy! Super easy and fast to make.I agree – too much tomato sauce and overall sauce was more red than orange. Next time I will cut the tomato sauce in half. I agree. Way too much tomato sauce. I usually love these recipes but in spite of all the spices, the tomato sauce overwhelmed the whole dish. I was disappointed. Tried this tonght and just not a fan. It was my first time trying Indian food, so that is probably rhe reason. This was delicious! I added heaping teaspoons of all the seasonings and also added red pepper flakes and green bell pepper. Could not find lite coconut milk, but instead used reduced fat. Also used olive oil instead of coconut oil. Wish I would have doubled the recipe. Im surprised some found it watery and not flavorful my sauce was pretty thick and had great flavor! This was so delicious! I wasn’t sure how I would like the light coconut milk, but this was creamy and delicious! Super easy and quick to make. Recommend! Made this tonight and it was delicious. Didn’t have tomato sauce on hand but had diced tomatoes. Just used my immersion blender and made them into tomato sauce. Will pass this on to my Weight Watchers buddies to try. So easy. The only thing I might change is reducing the amount of liquid or increasing the amount of shrimp. Thanks so much. Will be checking out your other recipes. Any suggestions on the types of peppers shown in the picture? I am unfamiliar with various types of peppers. They look like sliced jalapenos or sliced serranos (which are hotter than jalapenos). I thought it looked like red and green thai chile peppers. Made this tonight and it was delicious! Thank you! Oh, and I used olive oil instead of canola or coconut. I don’t think the oil matters too much. use what you want. I made this with a few adjustments. First, I doubled ithe recipe (2 lbs of shrimp, 1 large can, 28 oz, of chunky tomato sauce (Furmans brand), 1 can of real coconut milk not lite (better flavor). I doubled all the spices except I left the ginger at 1 tsp. I also marinated the shrimp for 20 minutes in some lime juice and a sprinkle of curry powder before I cooked. I also wanted more veggies so added 1 large green bell pepper, chunky chopped, 1 large red bell pepper chunky chopped,1 jalapeno chopped and 2 stalks celery, sliced on bias, and 1 large sweet potato chopped in small pieces and steamed in microwave for approx 10 minutes so they are soft but firm (and won’t break up in dish when added). I sauteed onion for 2 minutes and added the peppers and celery and sauteed until they were cooked but crunchy. I added the sweet potato pieces after stirring in cooked shrimp. I garnished with red fresno peppers, ciliantro, italian parsley and green onions. Served over brown basmati rice. This is DELICIOUS and gorgeous as well. great for guests but easy enough for any night! and as a nutrition professor , these spices are so healthy in the flu season, very immune boosting meal. I made this tonight and was disappointed – with all of the great spices, there wasn’t a lot of flavor, we had to add more salt and sriracha to give it more oomph. The tomato taste was a little overpowering….I doubled the sauce and when I use it, I will add red curry paste. I have made dozens of Skinnytaste recipes and loved them all, but this one didn’t work out for us. Too much tomato sauce. I suggest an 8 oz can. This looks delicious but I’m not seeing the tomato sauce. It says a 15 oz can but only 3/4 cups of coconut milk. Seems like it would be more of a reddish tomato color. is it canola or coconut oil? The ingredients and step 1 say canola but step 3 says add the remaining tsp of COCONUT oil…. thanks! I made this tonight, and my husband loved it! He gave it a 10 out of 10! The only problem is I thought there was a lot of sauce for just a pound of shrimp. I think I followed the recipe right. Did anyone else think this? Planning to make this tonight. THE Ingrdients note canola oil but the directions state coconut. Also, at what step are you adding in the coconut milk? I see mention of coconut sauce. I wasn’t sure if that was a combo of the milk and tomato sauce or meant to be just the milk? It looks delicious and will be my first curry! I made this recipe this morning as I had the ingredients on hand. I doubled the recipe and divided it up. I licked the bowl, spoon and saucepan. It is delicious. I will serve it with precooked shrimp tonight. Thanks. This looks incredible Gina! I can’t wait to make it! Question – I live in the UK and I’m a bit unsure about what you mean by “tomato sauce”? Do you have pureed tomatoes? That would work. Hey there. I am from the states but lived in the UK for a few years the tomato passata is VERY close to tomato sauce. It is what I always used in my recipes when I needed tomato sauce. Hope this helps. I will definitely make this over the weekend. Love the idea of making a double batch and freezing! Thank you! can you substitute chicken breast? If so how much chicken and use different spices? Made this last night and it was really good! Made a few adjustments, added a tiny bit of Stevia, pepper and a touch more salt. Received rave reviews. I cannot eat coconut products. Do you have a good substitution for the coconut milk? Curry is my love language lol!!! Thank you for this recipe. I’ve made quite a few of your recipes lately and thought how nice it would be to have your recipes and their point values pre-loaded into the Weight Watchers app!! Goals!! If you decide to use whole can of coconut milk, would you double the spices? I would double everything, including the tomato sauce. Do you add coconut milk with tomato sauce no mention of when to add coconut milk. Recipe is a bit confusing? Also, use canola oil or coconut oil. Yes I found it confusing too. Step 7- do you mean coconut milk? Thank you! Will be making this tonight. I assume she means coconut milk. Well, I’m hoping she does because I’m making it tonight! This looks amazing! I love Indian food and usually avoid it on WW, so this recipe is perfect and low in pts. Add some avacado and cashews and it’s like Massmann Shrimp! I’m making it tomorrow night! Thx!! I love all of your recipes and this looks delicious. Do you think it would be freezer friendly? This looks delicious. Definitely going to try it over the long weekend. I think you meant coconut milk not coconut sauce in step #7, yes? :o) Also, do you think it would work to poach the shrimp in the sauce instead of stir-frying it? Or, will the result be rubbery shrimp? Just an idea. Does it have to be canned coconut milk? What about from the carton? Can I use unsweetened coconut milk from the milk aisle, as in carton milk – NOT the canned version? how long do you cook the tomato sauce and coconut milk with the shrimp and onion? also is the red veg in the picture a red pepper or habanero? The red and green peppers in the photo are chili pepper used as a garnish. The red one might be a red jalapeno or another red chili pepper. Use whatever garnish you like. making this tonight! fell off the wagon this past weekend..which turned into the rest of the week… but this is pushing me to get back on! Can you make this in an instant pot? Sure but it’s so quick I wouldn’t personally. Now I know what’s for dinner tonight! I don’t have coconut milk, but have some fat free 1/2 n 1/2 and I don’t have curry powder but have gara masala so gonna substitute those this time, hope it turns out ok 😉 Absolutely love all your recipes Gina! did you try the gara marsala yet? If so, how did it work out? I was thinking exactly the same thing! I have everything for this except the curry powder. This recipe sounds so good. Step 7 says to add the shrimp and coconut sauce. Do you mean coconut milk? I just want to make sure I didnt miss something. I love Indian food. Thanks ! It looks great. Is there a seasoning blend out there I could use so I don’t have to buy ground ginger, corriander, tumeric ect…? You could try a “curry” blend, there are different varieties in the supermarket spice section. Can you use almond milk instead of coconut milk? This looks amazing! I must put this on my dinner menu for next week. I have been making your recipes for years but recently my husband and I started living a healthier lifestyle so I now make your recipes probably 5 nights a week. Always get rave reviews on everything I make. Love the variety of cuisines too. Thank you for all these great recipes Gina! Coconut oil or Canola oil? I see no mention of coconut oil. You can use either or. This looks amazing but the directions say coconut oil and in the ingredient list says canola oil. I assume you really mean coconut oil? Either one can be used.